In the Main Menu, click Setup, Manage, Manage Preferences. Alternatively, click Setup, Module Preferences, Manage tab. Set default options and settings for features in the Manage module. To enable a preference, check the box or uncheck the box to disable. Send all new prescriptions to electronic queue: Only added for 2011 EHR certification. Time Card first day of week for overtime: If using time cards, set the first day of the week used to calculate weekly overtime (over 40 hours). See Time Card Setup. ADP Export includes employee name: Select whether or not to include employee names when exporting time card data in ADP format. This information is not needed by ADP, but may make output more readable. Unchecked: Do not include employee names. Claim Send window validate on load (can cause slowness): Select when to validate e-claim information on the Insurance Claims window (Send Claims). Checked: Open Dental will validate e-claim information when the Insurance Claims window is loaded. When using Clinics this option can cause slowness. Unchecked: Open Dental will validate e-claim information when sending. Select all provider/employees when loading schedules: Determines whether providers and employees are automatically selected by default when you open the Schedules window (Schedule Setup). Checked: All providers and employees are highlighted by default when you open the window. Unchecked: No providers or employees are highlighted by default when you open the window. Billing and Statement Options: The options below affect billing defaults and what shows on Statement. Checked: Show the practice or clinic address as the return address. Unchecked: No return address shows. Show credit card info: Affects statements generated via the Billing List only. Checked: Credit card information shows so patients can enter credit card information. Unchecked: Credit card information doesn't show. Checked: Notes entered on the Payment window show with any payment entries. These notes always show in the Patient Account Grid in the Account module. Unchecked: Notes entered on the Payment window don't show. Checked: Notes entered on the Adjustment Edit Window show with any adjustment entries. These notes always show in the Patient Account Grid in the Account module. Unchecked: Notes entered on the Adjustment window don't show. Checked: Additional financial information will show in the Description column for each procedure (e.g. patient portion, insurance paid, write-off, adjustment). Unchecked: This information will not show. Account Numbers use: Select whether to use Chart Number or PatNum for the account number. Days to calculate due date. Usually 10 or 15. Leave blank to show "Due on Receipt": Enter the number of days that will be used to calculate the Due Date on statements. Days in advance to bill payment plan amounts due. Usually 10 or 15: Enter the number of days in advance of a payment due date that statements will be triggered to print when running billing. See Payment Plan. Checked: Statements generated from the Account module default to intermingle family members (mix patients in the same family together in one grid and sorted by date). Unchecked: Statements generated from the Account module do not intermingle families by default (each patient will have a section on the statement). Max number of statements per batch: Enter the maximum number of statements that will be considered a batch when sending statements via the Billing List. Number entered cannot be greater than 256. Enter 0 to set no limit. Will be ignored if using Output to File option in Electronic Billing. Useful for large offices that send many statements. Show progress when sending statements: Determines whether or not a progress bar shows when sending statements via the Billing List. Checked: A progress bar does show that includes options for pause, resume, cancel. Unchecked: A progress bar will not show. Print statements alphabetically: Only visible when clinics is enabled. Determines order statements are printed. Unchecked: Patients are ordered by clinic, then alphabetically by first and last name. 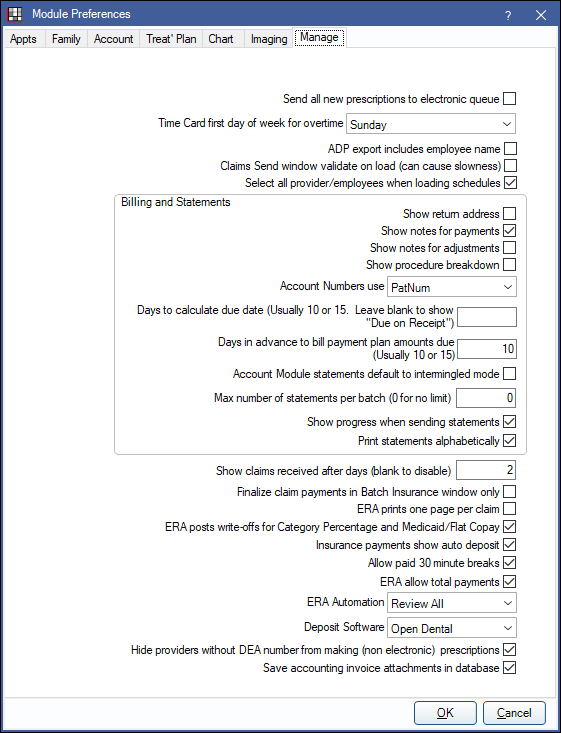 Show claims received after days (blank to disable): Zero dollar insurance claim payments received within the number of days entered will show in the Batch Insurance Payments window (Batch Insurance Payment) when finalizing an insurance check. If left empty, zero dollar insurance claim payments will be hidden. Unchecked: Users can finalize claims from the Claim or the Batch Insurance Payments window. Checked: Users can only finalize claims from the Batch Insurance Payment window. They will be blocked from finalizing claims on the Edit Claim window. ERAs print one page per claim: When printing ERAs, print one page for each claim listed. ERAs post Write-offs for Category Percentage and Medicaid/Flat CoPay: Determines whether write-offs will be posted for Category Percentage and Medicaid/Flat CoPay insurance plan types. Checked: Write-offs will be calculated and posted for all plan types, including Category Percentage and Medicaid/Flat CoPay. Unchecked: Write-offs will only be posted for PPO and PPO Fixed Benefit plan types. Insurance Payments: Show Auto Deposit: Determines whether or not automatic deposits for claim payments is enabled or disabled. Checked: Automatically create deposits when Finalize Insurance Payment. Unchecked: Do not automatically create deposits. Allow paid 30 minute breaks: Determines whether up to 30 minutes of break time is considered as paid or unpaid on time cards. Checked: Count up to 30 minutes of break time as paid time. Enables the View Breaks button in the Manage module and Breaks radio button on the Time Card for employee window. Also enables the Lunch status so employee can clock out for unpaid breaks. Unchecked: All break time will be considered as unpaid time. Disables the Lunch status and View Breaks button in the Manage module. Also disables the Breaks radio button on the Time Card for employee window. Note: Before changing this preference, have all employees clock out and make any needed time card adjustments. Changing the preference will not affect historical time card breaks. Breaks that occur while the preference is checked will remain as paid breaks. Breaks that occur when the preference is unchecked will remain as unpaid breaks.